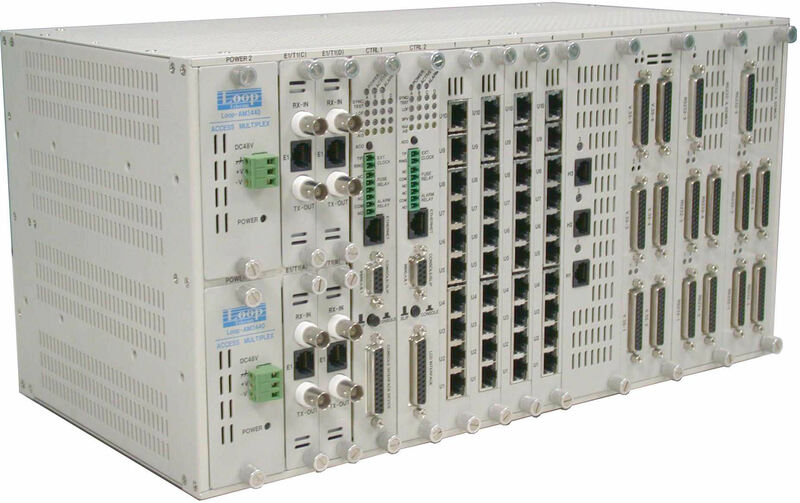 The AM-3440 is ideal for transitioning from TDM to Packet Switch technology! DS0 mapping with DCB's award-winning MAP34 graphical mapping software!Click here. The AM3440 is supported by DCB Add-in accessory products... Internal Ethernet Switch, Fiber Interface, HD-44 Cable Adapters now available!Details here. The new CCB controller card for the AM3440 was released in 2018! Four times the CPU speed and twice the memory prepare the AM3440 for the future. Read a comparison between it and the current CCA controller here. The AM3440-A/B/C is an access DCS-MUX that can combine various digital access interfaces into E1 or T1 lines or Ethernet networks for convenient transport and switching. 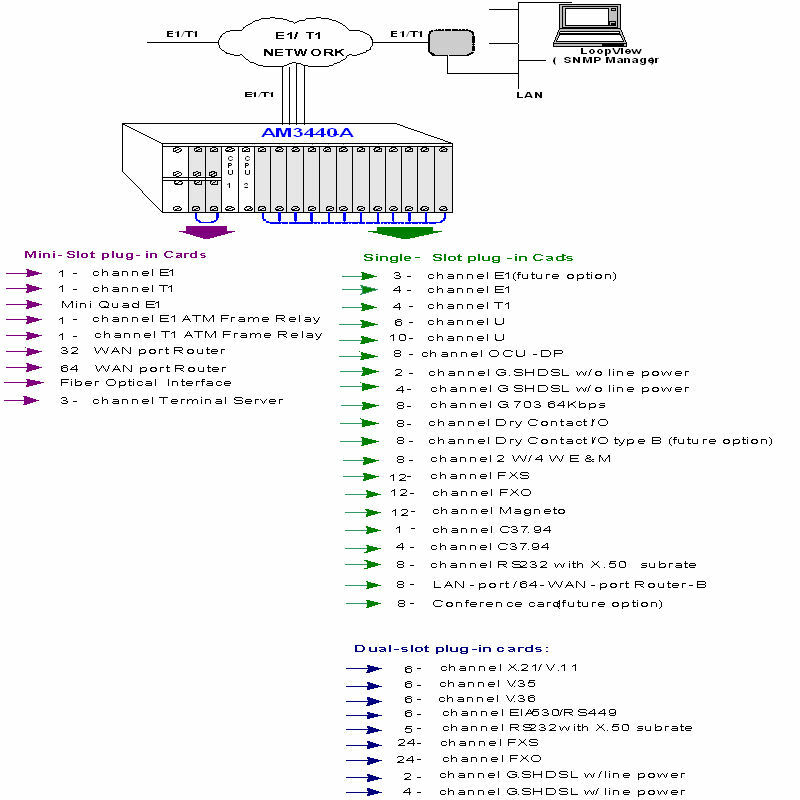 The AM3440 Access DCS-MUX provides access for a variety of interfaces, including TDMoE, mini Quad E1, Quad E1/T1, ATM/FR, 32 WAN port Router, 64 WAN port Router-A, Router-B, FOM, Terminal Server Card, G.SHDSL, G.703, U type, X.21, V.35, V36, EIA530/RS449, RS232, 8RS232, QEM, QFXO, QFXS, 8EM, 12FXS, 12FXO, 24FXS, 24FXO, and Magneto. These interfaces are compatible with other Loop products such as the Loop-H 3900 (MDSL), LoopH3300 and the Loop-U3500 (U). Using these products, a DTE interface can be extended over copper wire pairs. For as many Quad E1/T1 plug-in cards, each card can have as many as 124/96 time slots for the G.SHDSL, U, RS232, X.21, V.35, V.36 and EIA530/RS449 interfaces are then multiplexed to fill 4 E1/T1 line, with full flexibility of time slot interchange for all incoming lines. AM3440 also supports fiber optical plug-in module, which can be used to aggregate up to 4 E1 channels to single fiber optical interface to connect with other AM3440 or O9310. AM3440-A has capacity for 12 single slots and 4 mini plug-in slots. AM3440-B has capacity for 3 single slots and 4 mini plug-in slots. AM3440-C has capacity for 5 single slots and 4 mini plug-in slots. All interface cards and controller cards can be used in AM3440-A/B/C, except for the G.SHDSL line power card, which is for the AM3440-A only and mini-slot QEM/QFXS/QFXO interface cards, which are for the AM3440-B and AM3440-C only. This unit is a full cross-connect and can act as a mini DACS. This means that one or more of the WAN ports can be used as a Drop & Insert function with fractional E1/T1 lines, which can be muxed into a full E1/T1 line. The larger chassis supports 64 T1 connections. Redundancy is available in dual CPU controller and power supply options, making it an excellent fit for critical applications. Although the chassis does not contain and has no need for fan cooling, an external fan tray is available. An economical teleprotection transfer trip interface is also available. Remote Transfer Trip is commonly used in the power industry where high speed remote alarming is required, but also finds use in remote alarming applications in other industries. The AM3440 supports local control and diagnostics by using an external 2-line by 40-character LCD display and keypads, or by using a VT-100 terminal connected to the console port. The AM3440 also supports Ethernet, SLIP, Telnet, and SNMP, so that it can be controlled and diagnosed from remote locations as well. An in-band management channel with GUI is available. In addition to the LCD display, there are LED indications for all plug-in cards. Supporting Network Interworking (FRF.5) and service interworking (FRF.8). 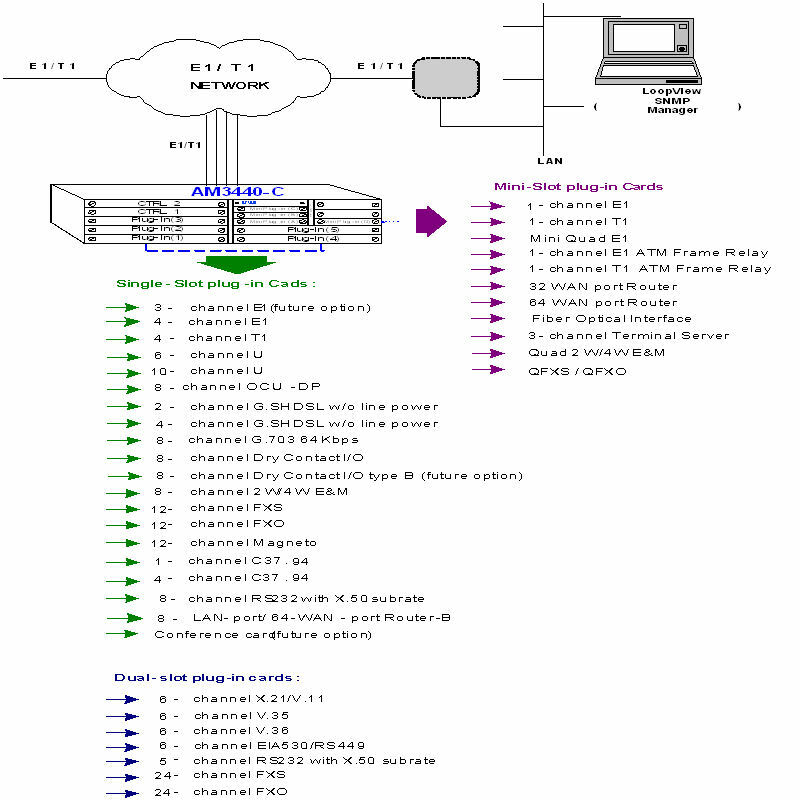 Up to 31 logical FR channels can be concentrated/ de-concentrated to FR or ATM. Supporting FR to FR multiplexing. Supports up to 128 DLCIs for total of 31 FR interfaces. Supports up to 128 VCs. Peak cell rate on DLCI basis. Manufacturing disable/enable ATM scrambling for internal testing (E1 ATM only). AAL0 and AAL5 are supported in the ATM adaptation layer. ITU FR management protocols are supported. Flash memory software download through RS485. Only the PVC type of ATM/FR service is supported. Point-to-point and point-to-multipoint. Each input port is associated with one DSO in a communication link to a remote output port in point-to-point; For point-to-multipoint, each input port is associated with N X DS0�s, where N = 2 or 3, in a communication link to N remote output ports. One Async RS232 port, two Async/Sync RS232 ports. The two Async/Sync ports can be configured independently as Asynchronous or Synchronous. NOTE: Mode (a) and mode (b) cannot be mixed. All in-band signaling tones are carried transparently by the digitizing process. Customer is responsible for in-band signaling compatibility between a telephone and a switch, or between a PBX and a switch. Signaling is carried transparently by the digitizing process. Ground Start, Metering pulse (12 KHz, 16 KHz), and P( in PLAR mode, PLAR signalling bits are programmable. Single/ Dual -48 Vdc: -36 to -75 Vdc, 100 Watts max. Single/ Dual -48 Vdc: -36 to -75 Vdc, 150 Watts max. Performance Reports Reports include MDSL port unsync Date & Time, Errored Second, Unavailable Second, E1 Bursty Errored Second, Severe Errored Second, Degraded Minutes, and Controlled Slip Second. Also available in Statistics (%). Please phone a DCB product specialist at 800-432-2638 for pricing and configuration options.